Buffalo, N.Y. — Visit Buffalo Niagara, the official destination marketing organization for Buffalo and Erie County, New York, unveiled the Buffalo Wing Trail at a press event this morning. Held at the Anchor Bar – the birthplace of the Buffalo Wing – the event revealed the “delicious dozen” restaurants that comprise America’s newest food trail. Wings have been a staple of Buffalo’s culinary scene since 1964 when Anchor Bar owner Teressa Bellissimo took the wings originally intended for a soup, fried them, tossed them in hot sauce and served them to her son and his friends – delighting the late diners and changing the course of American food history. The Buffalo Wing Trail will feature a dozen of the finest establishments serving wings in the city that invented them. Every one of these select wing joints has perfected their own variation on the wing, each with its own secret recipe and specific style of cooking, saucing and presentation. Visit Buffalo Niagara polled its more than 86,000 followers on Facebook to establish a list of the top wing restaurants in Western New York. VBN staff also reviewed local media outlets for previously published surveys and articles, checked online reviews and consulted with National Buffalo Wing Festival founder Drew Cerza before determining the final list of partnering restaurants. Each site on the Wing Trail was visited at least twice by VBN staff to ensure the highest standards of wing quality and customer service were in place. Buffalo Wing Trail brochures will be available at the Buffalo Niagara Visitor Center at the corner of Washington and Clinton streets in downtown Buffalo and at brochure racks at cultural attractions throughout the region. Each designated restaurant will be equipped with branded coasters, T-shirts for the staff, banners, window clings, check presenters and glass mugs to enhance the wing trail experience. VBN will frequently award photos posted by visitors on Instagram to #WingBUF with a selection of prizes like Wing Trail T-Shirts and chicken wing bottle opener refrigerator magnets. For more information and to view a video about the Buffalo Wing Trail, visit BuffaloWingTrail.com and follow @Buffalowingtrail on Instagram. Photo: Visit Buffalo Niagara’s Buffalo Wing Trail, a guide to 12 of the most iconic bars, taverns and pubs around Buffalo serving the city’s culinary creation, debuted on Thursday. 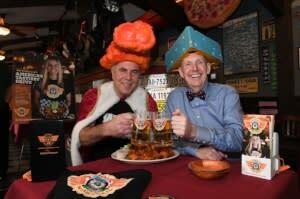 National Buffalo Wing Festival Founder, “Wing King” Drew Cerza, and Visit Buffalo Niagara President and CEO Patrick Kaler were on hand to unveil the trail at the Anchor Bar, which created the Buffalo-style wing in 1964. (Nancy Parisi photo).